HomeInformationMultiple Sclerosis and Cannabis: Is it Safe? Imagine having to take a prescription cocktail recipe that included: disease-modifying therapies (Immunosuppressants), relapse management therapies, symptom management therapies and experimental treatments. These pills can easily climb to twenty or thirty pills a day, an example could be: benzodiazepines for anxiety, opiates for pain, stimulants; to counteract the effects of the sedative medications, corticosteroids to counteract nerve inflammation, ocrelizumab (Ocrevus); the only medication approved for multiple sclerosis (MS) in the US, immunosuppressants, which; as the name implies, suppresses your immune system and the list goes on and on. This horror show of pills and even more pills is the life of a person with MS. Being diagnosed can be devastating; causing lifelong progressively debilitating damage to the central (brain and spinal cord) and peripheral (nerves in the limbs) nervous systems. There have been few sanctioned studies in regards to cannabis and MS; however, the studies that have been done have shown that cannabis usage with MS have helped the symptomatology of this debilitating disease. Studies involving cannabis in Canada have all found benefits to the usage of this flower. Some of the benefits of these Canadian studies conclude are: helping with depression, insomnia and fatigue, cognitive function, helping with muscle spasticity, including bladder. As legalization approaches in Canada, we will be allowed to fully explore the medicinal effects of cannabis in regards to MS and a variety of other illnesses. This will allow for many breakthroughs in research and a wider population base in which to compare the positive and negative effects of the flower. The evidence is mounting in multiple studies that cannabis, more specifically THC and CBD; help relieve the muscle spasticity associated with MS. THC and CBD have also been found to help with the pain associated with MS; as well as, sleep disturbances, inflammatory related conditions, muscle spasms, abdominal complaints, overactive bladder, it protects the brain and optic nerve, depression, anxiety and/or other mood disturbances. Doctors tend to shy away from recommending smoking in any form; as smoking is harmful to the lungs. Luckily, there are many other ways to ingest cannabis. Whether you chose edibles (please see our guide on edibles), vaping (my personal favourite), dabbing (another form of vaping concentrates) and even topically (including sublingual and rectal). “You won’t find any dispensary more dedicated to pleasing their customers then Cheapweeds.ca. 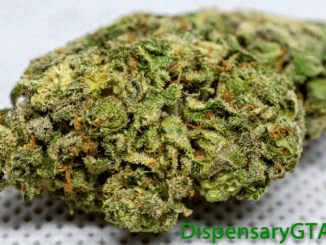 We have talked to the owner at length and trust this dispensary to deliver only the highest quality product to our valued DispaneryGTA readers. The more product you buy with Cheapweed.ca, the bigger the discount they offer you. For example, if you buy 3 ounces or more you can get 35% off your purchase price. With deals like that you really can’t go wrong with Cheapweed.ca. Use the coupon code “GTA5OFF” for 5% off the already discounted prices. Read our full review here and check out their website. “We at DispensaryGTA strongly recommend trying out Green Society for yourself. You will not be disappointed with this dispensary and it may have become our new go-to dispensary for exceptional quality bud at affordable prices. You can tell that this dispensary cares about its customers at every step of the process and I can not say enough good things about them. We recently ordered Red Lemon Congo after sampling it during our review and can’t wait for it to arrive; a true quad! Use the coupon code “GTAPLUG20” for 20% off this MOM dispensary. “Weedsmart.ca is a recent addition to the top recommendation section of DispensaryGTA; after going through some restructuring to their website and team, Weedsmart.ca has come back stronger than ever! This online Canadian cannabis dispensary ensures quality cannabis products and strive for their customer’s satisfaction and they also endeavors to provide medical cannabis to every Canadian in need. This has earned Weedsmart.ca a place on our recommended list; for their quality products, at exceptionally affordable prices. If you are looking for a dispensary that cares about its customers; Weedsmart.ca should be your next online mail-order marijuana dispensary that you order from. This dispensaries customer service, high-quality product, and professional packaging all contributing to their placement on the list and we thoroughly enjoy ordering from them! Use the coupon code “GTA10” for 10% off this MOM dispensary. What Strains do I Use? There are countless strains out there and different strains help with different symptoms. Typically, indica plants are short, bushy plants with wide leaves. Indica plants typically grow faster and have a higher yield than the sativa variety. Medicine produced from indica plants have higher CBD and lower THC counts. Sativa plants are opposite of the Indica strains and grow tall and thin with narrow leaves. Sativa plants are also generally a lighter shade of green then their counterpart, the indica strain. Sativa strains take longer to grow, mature, and require more light. Medicine produced from sativa plants have lower CBD and higher THC counts. Hybrid strains contain a mix of sativa and indica genetics and depending on their lineage, can take on characteristics from both strain families. These are the strains that someone with MS should focus on; they can help with many symptomologies simultaneously. Marijuana has some side effects and long-term risks. They’re the same whether you use it for fun or as medicine. Most people who use marijuana, like most people who use alcohol, do not develop problems with addiction; however, it could be a possibility for some. About 2% of adults and about 9% of young people who use marijuana become addicted; however, it is not a physical addiction like with opiates or other addictive pharmaceutical chemicals. It is a physiological addiction; in which, the user becomes reliant on the natural flower as a coping mechanism for normal life situations.